There have been some excellent reviews of Andy Crouch’s book and I don’t want to duplicate those efforts. So in my review, I would like to work with Andy Crouch's own idea. At the end of each chapter's look at another way of "putting technology in its proper place," he gives a "Reality Check" about just how well his family (and he himself) have been doing that. I would like to give my own reality check for some of the chapters' insights. For instance, the introduction speaks of "the value of the nudge" - changing the environment in small ways to make it easier to do the right thing (like sitting where there are no screens to distract us). In our own house, we have nudged our living room into a higher priority than our "rec room" by putting our nicest couch there and putting a puzzle on the coffee table - an activity that makes real conversation more likely than watching the latest on Netflix or the news. At the same time, I can't say that I have been as faithful in keeping to the "disciplines" that Crouch defines as deliberate routines to give us "spiritual resources" necessary for fruitful living. More on those disciplines later. Among the ten commitments that Crouch urges us to make wisdom and courage the goals of our life together as family – a worthy goal, and one I would have loved to have been challenged with years ago. We did seek to make the Sabbath a feast day, at least in the evening, but I'm not sure whether we ever made it an intentional rest from the continual distraction of our screens – a practice that would have made more time for meditation on the Word we heard preached that day. And while I have never needed to take my phone to bed, some of our children used the alarm excuse to keep theirs at night - not something that leads to real nighttime refreshment. Crouch's fifth commitment is an interesting one to ponder for me as a teacher: no screens before "double digits" - 10 years old - at school and at home. Our school does use Chromebooks extensively before age 10, but I think that they are well integrated into the language arts program in those grades. More to the point, this year I drifted into allowing junior high students the opportunity to play video games on computers at lunch – better than playing in isolation on their phones, I thought. Next year, we will be cutting off the "arcade," and have already begun to supply a growing hoard of board games as more social, brain-engaging alternatives for the non-gym-inclined kids (much like myself!). Crouch's seventh commitment - "Car time is conversation time" - is one that we have adhered to often in the last few years, but we did have one of those vans with the DVD player, and we did rely on it on long trips. Maybe that was a good exception. Now the DVD player is out of the picture, and in the few trips that we still have with our youngest adult son, we enjoy a mix of radio, podcasts, music CDs, audiobooks, and conversation. Does that leave enough time to get past the seven-minute barrier that Crouch says is necessary for deeper, risk-taking conversational revelations? I hope so. I love listening to compact discs, so Crouch's commitment to make singing (our own singing, not recorded music) a prominent part of family life and church worship intrigued me. We could certainly make that a greater part of our family's devotions, but I am especially looking forward to our own congregation's making singing together not only part of worship, but also an "event" on its own, in a Sunday potluck dinner plus singalong. 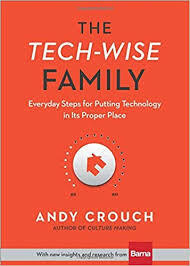 Keeping in mind that I have not dealt with all Crouch's ten commitments, I hope that these reality checks show that his book provoked a great deal of reflection for me on technology's place in family, school, and church life. If you think that The Tech-Wise Family can help you in putting technology in its proper place, you can get it here in the U.S., and here in Canada. Get it sent free to your email inbox! Why is dystopian fiction worth reading?